Harold Giles, MD, examines a patient with kidney disease. End-Stage Renal Disease (ESRD), or permanent kidney failure, affects almost 750,000 people per year in the United States, and the patient population is increasing by five percent each year. The state of Alabama is fifth in the nation for kidney disease with 11,000 people currently on dialysis and 1,600 waiting for a kidney transplant. The most common causes of ESRD in our state and region are diabetes and hypertension, but researchers have identified genetic causes for kidney diseases, according to physicians Harold Giles, MD and Jeffrey Glaze, MD, both with Nephrology Associates in Birmingham. "We are identifying some genetic causes that were previously labeled as hypertension," Glaze says. "One of those is a genetic variant called APOL-1 gene mutation. It causes kidney failure in African Americans and is likely a reason that many young people develop kidney failure. "Studies are underway to identify treatment options for this problem, because currently there are none. Polycystic kidney disease is also genetic and is responsible for about four percent of people who are on dialysis. Currently, there are treatments that have been shown to slow the progression of the disease but that aren't necessarily curative." There are five stages of kidney disease based on a person's glomerular filtration rate (GFR), a test that determines how well the kidneys are functioning. "The GFR measures the filtration ability of the kidneys, and as it declines, the patient will progress through the stages of kidney disease," Glaze says. "Stage five is a GFR of less than 15, and that's when most people end up on dialysis." Once a patient is diagnosed with kidney failure, the options are dialysis or a kidney transplant. "I believe the best option for these patients is a transplant, because it is associated with the highest rates of survival," Giles says. "Home dialysis is the next best choice." Jeffrey Glaze, MD, and patient discuss treatment options. Although home dialysis has been available since the 1960s, for a number of years most patients went to a dialysis center for treatment. "In the past decade, there have been upgrades and changes to the way patients do home dialysis which has made it easier and more successful for patients. The technology has simplified dialysis in such a way that it is available for more patients," Glaze says. There are two types of home dialysis therapy - peritoneal dialysis and hemodialysis. Both are equal in results, so patients can choose which type they prefer. 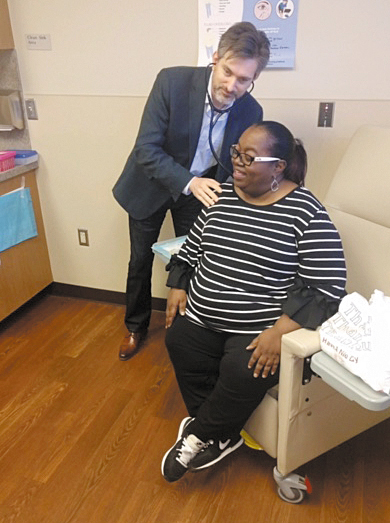 Each patient is trained in one of the two Nephrology Associates centers, located in Birmingham and Anniston, before beginning dialysis at home. Peritoneal dialysis uses the lining of the abdomen to filter waste from the bloodstream. It uses the blood vessels in the lining of the peritoneum to naturally filter and clean the blood. Dialysate fluid is circulated into the peritoneal cavity either manually or by using a PD dialysis machine called a cycler. The fluid then absorbs the waste, toxins and excess fluid from the blood, which are removed when the dialysate is drained. The in-and-out process is repeated several times a day using fresh dialysate. Home hemodialysis is basically the same process that is used in a dialysis center, but it is done with slightly different equipment. It involves blood and needles and may require a partner for each treatment. During home hemodialysis, the blood is filtered outside the body through a dialyzer or "artificial kidney" to remove unwanted waste, toxins and excess fluids. Hemodialysis uses dialysate solution to remove unwanted substances from the blood. Clean, chemically balanced blood is then returned to the body. "There is no clinical study that says one method is better than the other. From an outcome standpoint they are equivalent. What's better is the one that is most suited for each individual patient," Glaze says. Giles agrees that it is the patient's choice, but regardless of which method they choose, home dialysis can be satisfying. "Many patients think they can't do home dialysis, but I see a lot of people who are happy not having to go to a medical facility for care," he says. "If you go to a center for dialysis, you will have to go 13 times a month and sit for an average of four hours per treatment. It is tiring and a more intense cleaning that can lead to intolerance of the procedure," he says. "Home dialysis is done more frequently so it functions more like the kidneys. It is easy to do and gives the patient a gentler form of therapy with less fatigue so that they can be more independent and spend less time in a medical facility." Glaze believes that home dialysis can improve the quality of life for patients. "Except in rare circumstances, these patients will be on dialysis for the rest of their lives unless they get a kidney transplant Glaze says. "Home dialysis allows people to continue with their lives, going to work and having a family life. It doesn't alter their lives as much as going to a center for dialysis."